He seems born and framed for friendship, and is a most faithful and enduring friend. . . Though he is rather too negligent of his own interests, no one is more diligent in those of his friends. In a word, if you want a perfect model of friendship, you will find it in no one better than in More. These were words written by the great humanist scholar Desiderius Erasmus describing Thomas More. 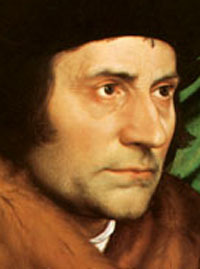 But as is often the case, when Sir Thomas More’s fortune and power began to fade away, so did many of his friends. This same Erasmus would virtually desert Thomas More a few years later during his time of greatest need. As I was doing research for my novel the name Antonio Bonvisi kept popping up. There is not much historical record of him, except that he was an Italian merchant who lived in London. It seems Bonvisi and More became friends in their twenties and rejoiced with one another as both their families and fortunes prospered. But when More made the fateful decision to go against King Henry VIII Bonvisi never stopped doing whatever he could for his friend. It was certainly not wise to do so, as More had became somewhat of a pariah. Anyone hoping to court the King’s favor would surely know better than to show friendship to his “enemy.” But this did not stop Bonvisi from smuggling wine, food and warm blankets in to the Tower of London for his dear friend. There is even evidence he financially helped the More family as the King took more and more of their income away. For the felicity of so faithful and constant friendship in the storms of fortune . . . is doubtless a high and a noble gift proceeding of a certain singular benignity of God. Those words were written almost 500 years ago, and yet they are no less true today. Who of us hasn’t endured the heartbreak of a fair weather friend or felt the comfort of a steadfast one? History has the power to remind us that what is truly important in life has not changed. Whether it is Renaissance England or modern day America, true friendship remains a blessed thing. This entry was posted in Uncategorized and tagged constant friendship, desiderius erasmus, king henry viii, sir thomas more. Bookmark the permalink.